Taxation, Virtual Currency and Blockchain provides an in-depth and comprehensive analysis of tax implications that result from activities such as exchange of goods and services for virtual currency, exchange of legal currency for virtual currency, exchange of virtual currency for another virtual currency, currency mining and possession of virtual currency that appreciates in value. The emergence of convertible decentralized virtual currency schemes confronts tax authorities with unprecedented questions. Among them are the status of virtual currency for tax purposes, which virtual transactions may benefit from a VAT exemption and determining the most optimal method of tax regulation. This book is about traditional tax definitions which are embedded in the law and their ability (or inability) to encompass income generated by new types of economic activity in a manner that maintains both their theoretical justification and their practical implementation. The book has three parts and an annex that describes tax regulations, administrative rulings and court decisions concerning virtual currency in twenty countries. The book examines tax consequences of using convertible decentralised virtual currency schemes (such as Bitcoin or Ethereum) since such currency represents the vast majority of all virtual currency types. 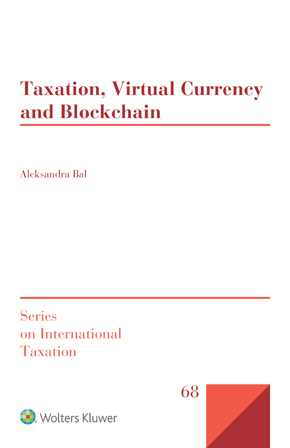 In its detailed overview of recent tax developments that affect virtual currency transactions and evaluation of tax policies related to virtual currencies, this book has no peers. Especially in view of the Organisation for Economic Co-operation and Development’s (OECD) examination of the tax challenges presented by the digital economy as part of its base erosion and profit shifting (BEPS) project, this clear and comprehensive explanation of the functioning of virtual currency and blockchain technology will be welcomed by tax administration officials and by persons mining and transacting in virtual currencies needing to know their tax compliance obligations.